The Smoky Mountains have long been a favorite destination of tourists of all ages and now more than ever the Smoky Mountains offer a great value for those on vacation all year long with so much to see and do so close by and at such affordable prices. The Great Smoky Mountain National Park (GSMNP) is the most visited national park in the United States with 11,312,785 visitors in 2016 and for some very good reasons. The GSM national park has some of the best hiking trails in the world. It is also very accessible by automobile, motorcycle, Campers and RVs. The GSMNP has a moderate weather and temperatures year round allowing visitors to enjoy springs and summers filled with beautiful wild flowers and spectacular vistas, and an unsurpassed fall leaf season which ushers in beautiful autumn colors from more than 110 different species of trees in and around the national park, and for those who enjoy mild winters just cold enough for a little snow to make things beautiful, the Great Smoky Mountain National Park fits the bill. 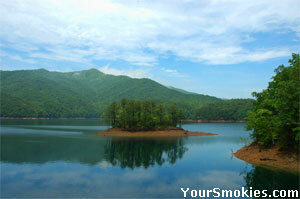 Beautiful views throughout NC and TN Smokies. Smoky Mountains: A year round vacation spot. The Great Smoky Mountain National Park also boasts great developed frontcountry campgrounds, backcountry shelters and plenty of primitive backcountry campsites. There is also fantastic hiking trails including a more than 70 mile section of the Appalachian Trail, and horse trails which wind through the entire park and spectacular waterfalls, meandering creeks and roaring streams, seem to be around every bend. Have lunch or dinner in one of the 11 GSMNP picnic areas. World famous Cades Cove gives you a chance to motor, bike or walk through smoky mountain pioneer history while surrounded by the beauty of mother nature in all of its splendor. Who could forget the beauty of these mountains and the beautiful rolling meadows abundant with wildlife? Lesser known Cataloochee NC is also loaded with wildlife and history. It is common all around the park to see whitetail deer, American black bear (around 1,800 reside in and next to the park), North American Elk, raccoon, coyote, fox, bobcat, squirrel including the endangered northern flying squirrel, chipmunk, woodchuck, river otter, Indiana bat, and more than 200 species of birds in the Great Smoky Mountain National Park. 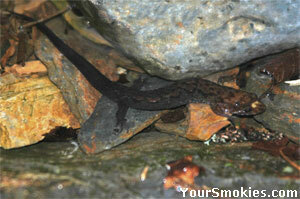 If that is not enough, the Great Smoky Mountains National Park has been named the "Salamander Capital of the World" since 30 salamander species in five families inhabit the Smoky Mountains which include the huge river hellbenders. Come here in June for the most amazing sight in nature, our synchronous fireflies in the Great Smoky Mountains that can only be found in the Smokies and a tiny place in Asia. You will never forget the experience of our special lightning bugs. Fishing in the Smokies is also a very popular sport year round in the mountains, valleys and lakes throughout Tennessee and North Carolina. Try your hand at catching brook trout, rainbow trout, small mouth bass, rock bass and more. Find out why so many serious anglers love the Smokies and why it is a fly fisherman's dream come true with streams boasting populations of up to 4,000 trout per mile! Thanks to restoration efforts for native fish and now the very carefull management, the Smoky Mountain National Park is now one of the last wild trout habitats left in the eastern US. To keep visitors to the national park informed, Your Smokies has continually updated reports on the hiking trail conditions in the Great Smoky Mountains national park and are tracking and updating conditions of backcountry campsites and campgrounds in the Great Smoky Mountains national park and the Backcountry Shelters conditions in the GSMNP. 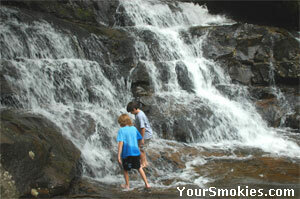 Smoky Mountains: Perfect family vacation spot! 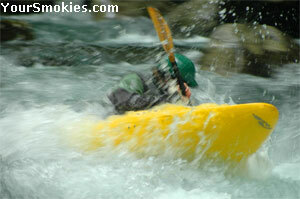 Kayaking in action packed Smokies Mountains. Not to be outdone by the Great Smoky Mountains national park, the Blue Ridge Parkway also managed by the National Park Service had more than 15.2 million visitors in 2012. The Blue Ridge Parkway actually starts at the edge of the Great Smoky Mountains national park between the Oconaluftee Visitor Center and the parks Cherokee North Carolina entrance and twists and turns its way 469 miles from North Carolina to the Shenandoah National Park in Virginia most of the time in elevations of around 3,000 feet offering stunning views to anyone riding on the parkway. Best driven in the fall colors! Besides the Blue Ridge Parkway the National Park Service controls and maintains the Foothills Parkway whose various sections include the section of 441 known as the Spur connecting Gatlinburg with Pigeon Forge Tennessee, the Foothills Parkway East connecting I-40 to 321 at Cosby Tennessee and the Foothills Parkway West on the outskirts of 321 at Townsend to US129. These roads are closed often in the winter when snow and ice make them impassible. Check our Smoky Mountains national park road conditions and Foothills Parkway Road conditions reports and stay in the know. Looking for something other than the National Park in the Smoky Mountains to keep the whole family entertained? Well look no further than the Smokies! How about indoor and outdoor amusement parks such as the Dollywood Theme Park, the NASCAR Speed Park, water parks such as Splash Country, live music, comedy shows, theater, living history reenactments, beautiful and challenging golf courses, indoor and outdoor putting courses, museums, snow skiing, tubing, Zip Lining, Ripley's Aquarium - the largest aquarium east of the Mississippi, casinos, art communities and indoor and outdoor shopping malls and outlet stores are found throughout the Smokies. 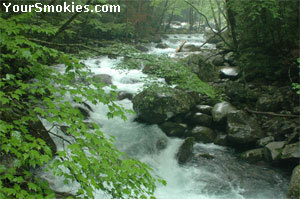 If it is fun, you will find it in the Smokies! The Great Smoky Mountains has become a prime location east of the Mississippi for Weddings and Honeymoons. Being surrounded by such natural beauty how could one not feel romantic? Being less than a full day's drive from most of the population in the continental United States doesn't hurt either. You will find plenty of wedding chapels in the Smokies - mostly in Gatlinburg Tennessee, Pigeon Forge Tennessee and Asheville North Carolina. While some couples come to the Smokies and get married in a simple ceremony, other rent large cabins, lodges and chalets and bring the whole family together. Whatever wedding ceremony you choose to have, the Smoky Mountains will make the perfect backdrop for your wedding and honeymoon and a lifetime of great memories at surprisingly affordable prices. The Tennessee and North Carolina Great Smoky Mountains are still one of the best real estate values in the USA. People come to the Smokies on vacation and fall in love with the Great Smoky Mountains and its people. Since the Smokies are so close by, they make the perfect place to buy a cabin, house or condo as a second home or as an investment as rental property. People from Florida are flocking to buy property in the Smokies. No more hurricanes, scorching hot summers or harsh winters and property in the area is still affordable with lots of great bargains. At Your Smokies we list North Carolina real estate agents and Tennessee real estate agents who know the area and can help you find the perfect place in the Smokies. Now is the time to invest in Smoky Mountain real estate while prices are still affordable for choice lots or homes with the best views! 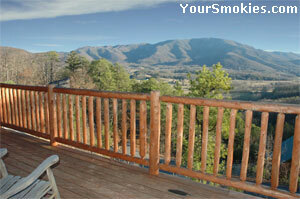 Smoky Mountains View from your Smokies cabin. Great Smoky Mountains Beautiful fall colors. The Smoky Mountains boasts more secluded and romantic honeymoon cabins and chalets than anywhere else. With beautiful vistas, The Great Smoky Mountain National Park, cozy log cabins with a crackling fire in the hearth, spectacular sunrises and sunsets, starry nights and still so affordable, isn't it time that you should discover what millions of others have each year? The Great Smoky Mountains are the most romantic place for lovers of all ages! Joins thousands of others a day who use us Your Smokies to find Smoky Mountain information, activities, businesses, and Smoky Mountain News on the Your Smokies Smoky Mountains Web site. 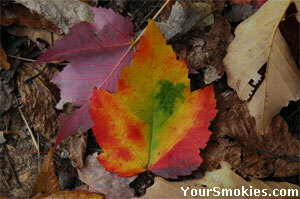 Your Smokies is a great way to advertise your local business. Along with great regional information of the Smoky Mountains area which will bring customers to your business we now have targeted pages on businesses and information on many cities and towns in the Tennessee and North Carolina Smoky Mountains such as Gatlinburg Tennessee, Knoxville Tennessee, Pigeon Forge Tennessee, Sevierville Tennessee and Townsend Tennessee as well as Asheville, Maggie Valley and Cherokee North Carolina.